Thanks to Luminis for the ARC of this book! As always, my reviews are fair and non-bias. 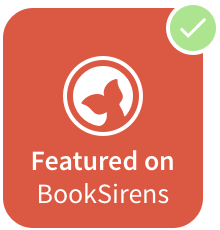 Perfect for readers who love books and series such as Vampire Academy, Spellbound, and Sweet Peril, Lost in Thought is a sure winner for young adult readers interested in the paranormal, romance, and action-packed twists. Lainey Young has a secret: she’s going crazy. Everyone else thinks she has severe migraines from stress and exhaustion. What she really has are visions of how people died—or are going to die. Not that she tells anyone that. At age 16, she prefers keeping her crazy to herself. When doctors insist she needs a new and stable environment to recover, Lainey’s game to spend two years at a private New England boarding school. She doesn’t really think it will cure her problem, and she’s half right. There is no cure, but as she discovers, she’s not actually crazy. Almost everyone at Northbrook Academy has a secret too. Half the students and nearly all the staff are members of the Sententia, a hidden society of the psychically gifted. A vision of another student’s impending death confirms Lainey is one of them. She’d like to return the crappy gift of divining deaths with only a touch, but enjoys spending time with Carter Penrose—recent Academy graduate and resident school crush—while learning to control it. Lainey’s finally getting comfortable with her ability, and with Carter, when they uncover her true Sententia heritage. Now she has a real secret. Once it’s spilled, she’ll be forced to forget protecting secrets and start protecting herself. This looked like a dazzling story full of twists and Paranormal secrets. What's not to love?! Lainey was a strong, powerful main character. Her view of the world, what was happening in her life, and how she dealt with it all, really won me over. I was definitely reminded of the Vampire Academy feel, with Lainey going to an Academy, too, but nevertheless, the stories were miles apart in anything else than that one resemblance. Lost in Thought had such a unique perspective on Lainey seeing how people were going to die, or did die. I thought that she took on her new "gift" with guts and an optimistic approach. But when it started to get more difficult, especially when she got to spent time with Carter and they delve into her "gift" a little more, things really pick up from there, excitement and more. But even that - her gift - had it's bad parts when they find out what her true background is, and what her secret gift really means, and let me tell you...if you thought it was a page-turner before that part, you'll be in for a whirlwind of realizations, action-packed scenes with crazy and drastic outcomes. Cara writes so effortlessly, I can tell, and it really showed how she got into the character of Lainey. 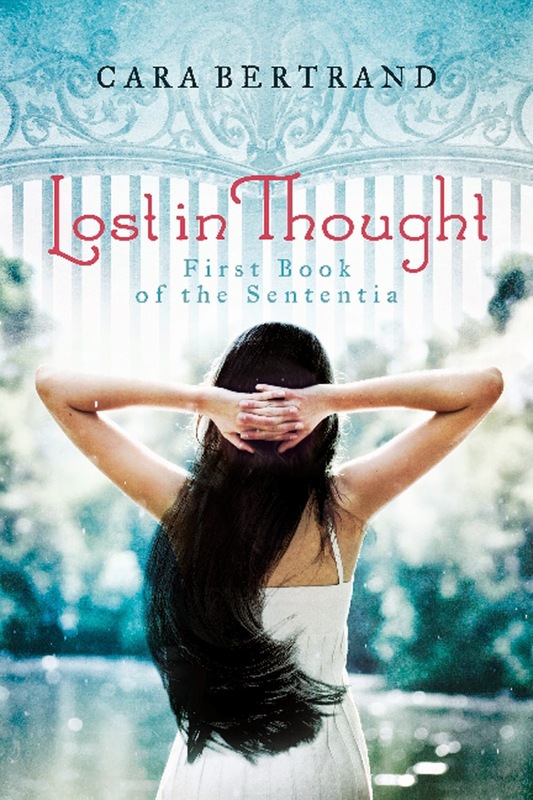 I always say that it's not just the character of the character, but half to do with how the author writes the character, that makes a book amazing, and this was definitely no exception - Lost in Thought was a surprising, enthralling book that I liked so much - anyone who loves the Paranormal genre with a hint of romance and heritage, will eat this up. YA Paranormal romance fans, or YA Paranormal / Fantasy in general. Seriously, even if you haven't read Fantasy books before, you might just fall for this one. 1 Winner will get a pair of earrings made by Cara herself. Winner chooses which they want! 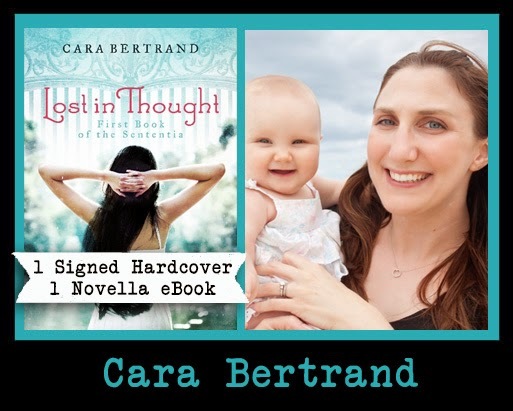 Cara is a former middle school literacy teacher who now lives in the woods outside Boston with: one awesome husband, two large dogs, one small daughter, and lots of words.